The piping Welder is somebody that performs welding on pressure piping within an industrial setting. Mostly we will be looking at piping welding under field conditions. This type of work, when done within a workshop, may be done by a welder that specializes in pipe welding, but in all probability it will be done by somebody in a more generalized fabrication workshop environment. Click here for more information on fabricator Welder jobs. You can take a look at "The WelderDestiny Compass" back-issues by clicking here. A general trend in large petrochemical plant construction, is for modular construction. This entails the construction of sections of the plant (modules) within a large construction yard / workshop where construction can be done in the most economical way practical. 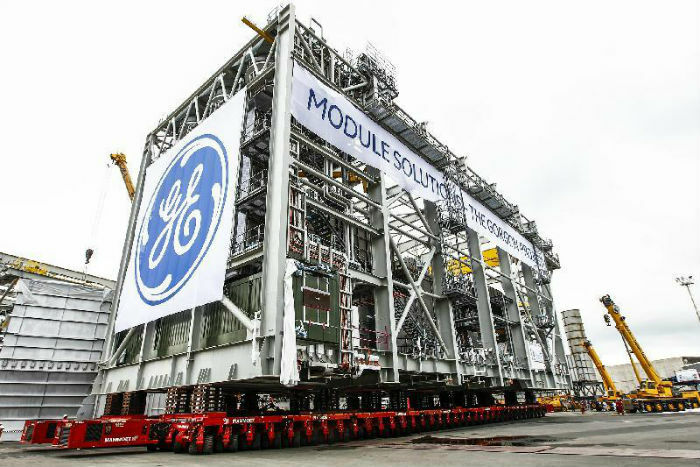 These modules are then transported to their final destination and assembled in the field. 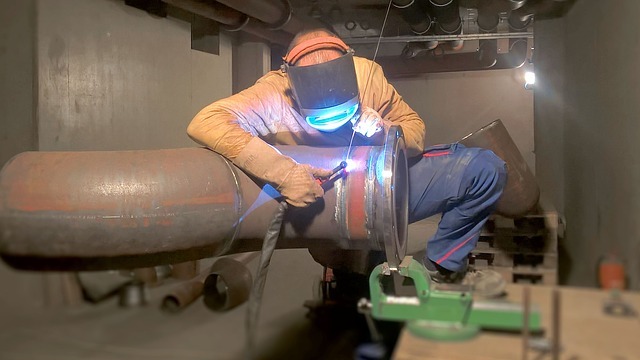 Most of the pipe welding therefore takes place within a more controlled fabrication shop environment, but there is still a lot of work for the pipe Welder out in the field, because often the method of joining the modules together is by welding rather than by flanging. (Bolting) My experience with modular construction so far is that there are a lot of unresolved quality issues. This is inevitable, given that we are close to the beginning of this trend. As more people gain experience with modular plant construction, these problems will be addressed. Another major source of work for the piping Welder is associated with maintenance and upgrades. Within this type of work, pipe spools are typically made up in fabrication workshops and then installed with field welds. For smaller bore piping, the pipes are often field run, so most of the welding is done by the piping Welder out in the field. No discussion about the piping Welder, will be complete without also discussing the pipefitter. In essence the pipefitter is the person that makes the pipes fit together. This job is more akin to being a boilermaker than a Welder. It is more about measurements and calculations (knowledge based) than the skill of welding. Having said this, there are many pipefitters that are also Welders. The all-round ability of being a pipefitter / welder is very attractive to employers where there is not enough workload to justify having two people around. Where there is a lot of work around, the employer will be more interested in the ability of each person, so a dedicated pipefitter and a dedicated Welder may be preferred, as it may be argued (rightly or wrongly) that a "specialist" will be more skilled than an all-rounder. None the less, having this dual ability will make you more marketable, which will be more and more important in the future as organizations move to leaner structures. Below is a list of materials that are typically welded in the petro-chemical, power generation and food industries. Some installations may be heavily skewed to one of the materials, but if you want to be a good piping Welder, then you should endeavour to get experience welding a wide range of materials. Some of the materials, such as aluminium and titanium are however normally welded by Welders that specialize in them, but if you can gain those skills you are certainly more marketable. Carbon steel: This is the material you will be welding most of the time. Nickel based alloys: There are a wide variety of nickel based alloys. These are mostly used in petro chemical plants for their corrosion resistance and the power generation industry for their high temperature resistance. Low alloy steels: There are a wide variety of low alloy steels designed for a number of different applications such as high temperature creep applications, or low temperature impact resistance. Aluminium: Generally, when aluminium needs to be welded in critical applications, a specialist aluminium Welder will be sourced, but if you have these skills you will definitely give yourself an edge in the market. Titanium: As with aluminium, titanium is normally welded by specialist Welders, but if you have the know-how to weld titanium, you will have an edge in the market. Gas Tungsten Arc Welding: (GTAW) Also often called Tungsten Inert Gas (TIG) welding. This is the go-to process for achieving very high quality welds, and is typically used for the root run of piping. Deposition rates are however normally low. There are automated variants of this process that can be used in the field, but is not yet mainstream. (See orbital GTAW below.) Currently the high deposition rate automated variants of GTAW do not lend themselves to field welding. Shielded Metal Arc Welding: (SMAW) This is also called Manual Metal Arc (MMA) or stick welding. This is probably one of the most versatile processes, although its use is reducing compared to past years. None the less, it is still one of the most widely used processes, so you need to know how to perform SMAW welding really well. Flux Cored Arc Welding: (FCAW) This process is largely replacing SMAW in any application where quite a lot of weld metal needs to be deposited and access for the equipment is available. It provides a significantly higher deposition rate than SMAW, and can be used in most of the applications where SMAW was used in the past. Having said this, there are some applications where it is not as good as SMAW. Gas Metal Arc Welding: (GMAW) Also called Metal Inert Gas (MIG) or Metal Active Gas (MAG) welding. A big application for GMAW in piping is for depositing single sided root runs in pipe, using special wave form controlled short circuiting transfer processes such as Surface Tension Transfer. (STT) STT is a Lincoln Electric trade name. Other equipment suppliers have their own equivalent equipment, but they will give it their own name. Orbital GTAW: (O-GTAW or O-TIG) This is an automated GTAW process which is often used for small diameter Corrosion Resistant Alloy (CRA) piping applications. For the Welder this is mostly a matter of learning how to use the necessary automated equipment, rather than it requiring a high skill level. None the less, there are quite a number of different orbital GTAW equipment manufacturers, and they all have their own issues. There are also orbital GTAW systems aimed at larger diameter piping, but they are not presently able to provide great benefits in terms of productivity or quality, so they have not taken off in a big way for field welding. As automated systems become more robotic, it is anticipated that this process will make a big impact on field pipe welding. If you have the opportunity to get exposure to this, make sure you take advantage of it.